Postcards From The Smokies » It’s November and the Pool’s Open. No Water, No Problem. It’s November and the Pool’s Open. No Water, No Problem. The Smokies’ favorite pools are dry. 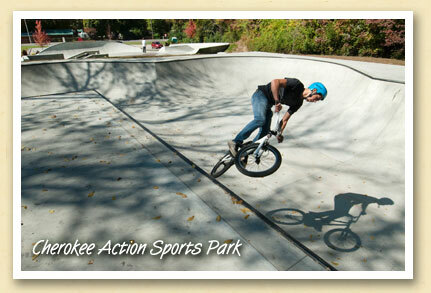 And the area’s skateboarders and BMX freestyle sport cyclists wouldn’t have it any other way. The ‘pools’ are features in the new $600,000, 13,000 square foot Action Sports Park in Cherokee — a 6’8″ peanut shaped bowl and a 3500 sq. ft. flow bowl (above). And that’s just half of it. The other half is a large street course with multiple levels and obstacles. Designed by Pillar Design Studios and built by Artisan Skateparks, the state-of-the-art facility was funded by the Eastern Bank of Cherokee Indians to provide activities for area youth. It’s open daily from 8am to dusk and is free for all to enjoy.